A Soyuz spacecraft has docked with the International Space Station, six hours after it took off from the Baikonur space center. It was carrying Russia’s Mikhail Kornienko and American Scott Kelly who are set to beat the record for the longest space trip. 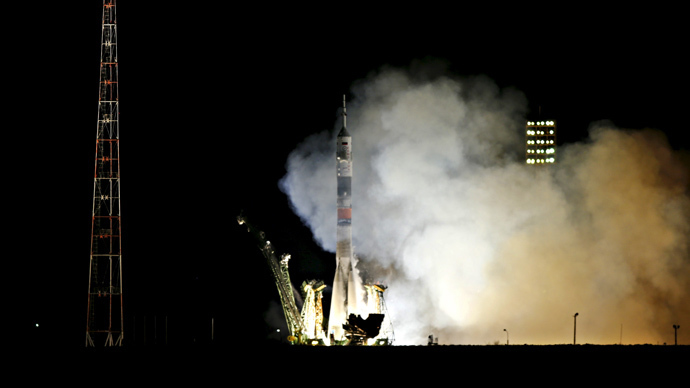 The Soyuz TMA-16M spacecraft arrived at the space station, delivering Kornienko and fellow Russian cosmonaut Gennady Padalka, as well as NASA astronaut Kelly. Kelly and Kornienko have both been sent on multiple missions to the ISS, with the missions usually lasting around six months. The latest expedition will see them spend 342 days in space, which will set a new record for the longest period outside the earth’s atmosphere on the Intentional Space Station. Padalka’s trip will last six months before he returns to earth with a total of 878 days onboard the ISS throughout his career – thus breaking another record for the sum of days spent in space. During the 1990s, four Russian cosmonauts spent between 12 and 14 months aboard the Russian space station Mir. The historic mission has extra significance as Kelly has left an identical twin on Earth, retired astronaut Mark Kelly, who will serve as a ground-based subject for genetic and other studies. “The classic question is ‘How much of our health and our behavior is determined by our genes, and how much by our environment?’ – the nature versus nurture discussion,” Craig Kundrot, deputy chief scientist of NASA’s Human Research Program, said in a NASA interview. The Russian cosmonauts are planning to carry out 49 experiments, with almost half of them concerning the medical sphere, as well as one spacewalk. They are also bringing a Victory Banner and a small Russian national flag with them to celebrate Victory Day on May 9. The flag will be marked with an onboard stamp and then taken back to Earth.